By the 1970s, Dallas Cowboys' General Manager Tex Schramm had developed a reputation for making spectacular draft-day trades that led to the acquisition of highly rated potential superstars. Three exceptional defensive linemen - Bob Lilly, Ed "Too Tall" Jones and Randy White - all were acquired by the utilization of this strategy. Just before the 1977 draft, Schramm struck for a fourth time. That year the coveted collegian was Tony Dorsett, an All-America running back from the University of Pittsburgh. The only problem was that the Seattle Seahawks had the second pick in the first round and they had made no secret of the fact they would pick Dorsett. Tony Dorsett eludes a tackle from Steelers DB Tony Dungy. So Schramm made the proverbial offer "that was too good to turn down" - Dallas' first-round pick (No. 24) and three second-round choices. While the trade gave the Seahawks, in only their second year of operation, an unusual opportunity to build their young team, it gave the Cowboys even more, an explosive running back that could add still another dimension to an already-powerful offense generalled by Roger Staubach. Even the Cowboys could not have envisioned the impact that the 5-11, 185-pound 1976 Heisman Trophy winner would make in the NFL. He became the first player ever to gain more than 1,000 yards in each of his first five seasons. He had 1,000-yard campaigns eight times in nine years. His only miss came in the strike-shortened 1982 season. 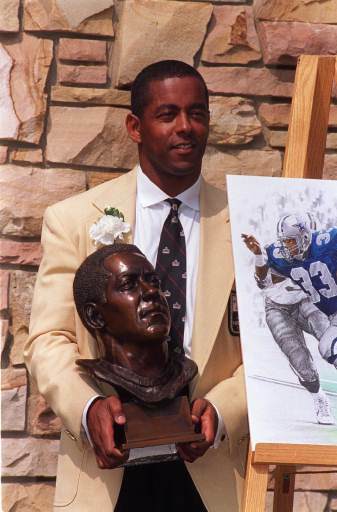 Dorsett played for the Cowboys for 11 seasons through 1987 and then finished off his brilliant career with the Denver Broncos in 1988. He rushed for 12,739 yards and accounted for 16,326 combined net yards in 12 seasons. Tony not only passed Jim Brown in both categories but ranked second behind only Walter Payton at the time of his retirement early in 1989. And the effect he had on his team can be gauged by the fact that he rushed for more than 100 yards in 46 games. The Cowboys won 42 of those 46 games. Throughout his career, his fanatic followers insisted he would be elected to the Pro Football Hall of Fame in his first year of eligibility and they were right. In 1994, Dorsett was one of six new members elected to the Hall. While the Cowboys were sure they were getting the racehorse running back they needed to continue their winning ways, it is doubtful even Schramm and his cohorts truly expected all of the exceptional deeds that Dorsett accomplished in the next few years. What they got was a player who had it all . . . the swift, smooth strides; the sharp, crisp cuts; the uncanny knack of finding daylight in the chaos along the line of scrimmage. Every time he touched a football, opponents shuddered. He turned small gainers into big gainers and routine plays into touchdowns. As a rookie, he rushed for 1,007 yards and 12 touchdowns and added 273 yards and a touchdown on 29 receptions. Tony was named the NFL's Offensive Rookie of the Year. The Cowboys marched all the way to Super Bowl XII against the Denver Broncos. In that game, Dorsett rushed 15 times for 66 yards and he scored the game's first touchdown on a three-yard burst in the opening quarter to get the Cowboys started to a 27-10 victory. Dorsett was even better the next year. He gained 1,325 yards rushing and 378 yards receiving. Dallas advanced to the Super Bowl again, but lost this time to the Pittsburgh Steelers, 35-31. Dorsett didn't score but he averaged six-yards-per-carry for 96 yards rushing and added 44 yards on five receptions. No player on either team matched his 140 combined yards. As the years marched by and the 1,000-yard seasons continued to come in an almost automatic fashion, Dorsett clearly showed his capabilities of making the game-breaking, long-distance gains both by running and receiving. In his 12 years, he had runs of 75 or more yards five times. In 1978, he scored against the Baltimore Colts on a 91-yard screen pass. Dorsett capped off the 1982 season even though the game was played before a Monday night television audience on January 3, 1983 - with a 99-yard touchdown run against the Minnesota Vikings. This unbreakable record was interestingly, established on a play that saw the Cowboys have only 10 men on the field. Dorsett's running back companion, Ron Springs, unaware of the play being called, watched the record run from the sidelines. The former University of Pittsburgh star reached the peak of his career in his fifth season in 1981, when he rushed for a team-record 1,646 yards. He also caught 32 passes for 325 yards that year. Tony had been reluctant in his earlier NFL years to get too involved in summer training regimes but, before the 1981 campaign, he decided to turn over a new leaf. As a result, he reported to the Cowboys in the best shape of his career and it showed in the outstanding season that would follow. Dorsett rushed for more than 100 yards nine times in leading the Cowboys to a 12-4 record and another NFC Eastern division championship. And in so doing, he caught the attention of Jim Brown, the former fullback great of the Cleveland Browns whose records in the early 1970s were still the yardstick for all potential immortal running backs. "Anytime you talk about a running back you have to take his situation into consideration," Brown said. "When you're talking about Earl Campbell, for instance, you are talking about a great back who is with a team which clearly looks to him as The Man. They know it and he knows it." "In Dallas, Dorsett has not gotten the ball as if he was The Man," Brown continued. "Until this year, Staubach fills that role. So what you have is a great back working under a strict system. It's illogical to expect Dallas to abandon its system, so what Dorsett has to do is fit in." But "fitting in" was never easy for Dorsett, who up until the time he arrived in Dallas, was always The Man on any team for which he ever played. Anthony Drew was born to Wes and Myrtle Dorsett on April 7, 1954, in Rochester, Pennsylvania. When his parents moved to be near the Jones and Laughlin Steel Mill in Aliquippa when Tony was young, they hoped at least one of their seven children would reach beyond the town's limits. Tony was the only one who ever did. Tony's sleep was often dominated by nightmares that included death and a fate nearly as bad - life in the steel mill. But Tony had visions that went beyond the steel gray hue of Western Pennsylvania. Unlike his four older brothers, Tony went to college. While Tony was still attending Hopewell High School near Aliquippa, his coach, Butch Ross, made a wise decision to switch him from linebacker to running back. Dorsett gained 1,034 yards as a junior in high school and his record of excellence continued unabated when he moved up a step to the University of Pittsburgh. Dorsett's record with the Panthers was legendary. He was named to an All-America team as a freshman and again as a junior and senior. Playing under Coach Johnny Majors, Dorsett became the first college back to run for 1,000 or more yards four seasons and the first to gain more than 1,500 yards three years. He established an all-time NCAA record of 6,082 yards. His best season as a senior saw him running for 1,948 yards and 21 touchdowns. With that collegiate success came fame and attention that Dorsett would have preferred to forego. With every tackle he broke and touchdown he scored, the pace got faster. After his senior season, he earned nearly $20,000 from personal appearances alone. There was no privacy. There were too many demands of the banquet circuit. Between the end of his college career and his NFL debut, Dorsett's priorities got mixed up. "I was at banquets with the president of the United States," Dorsett said. "It was kind of mind-blowing . . . something that a guy shouldn't go through until he was completely ready." By the time he arrived in Dallas training camp in Thousand Oaks, California, in the summer of 1977, Dorsett didn't know where to turn. First he lived in the fast lane -- in a posh apartment in a fashionable neighborhood. Then he moved to a sprawling country house 25 miles from Dallas and finally, after hearing critical words that his lifestyle did not match the image of America's team, he opted for a quieter home life. The Cowboy's players, however, accepted Dorsett in spite of the criticism that they felt was unjustified. When Tony signed a $1.1 million deal in 1977, Roger Staubach, the team leader who made only $250,000 annually, said: "If Tony Dorsett helps us win the Super Bowl, I don't care if they give him two million. If he doesn't help us win the SuperBowl, then he can give one million back." 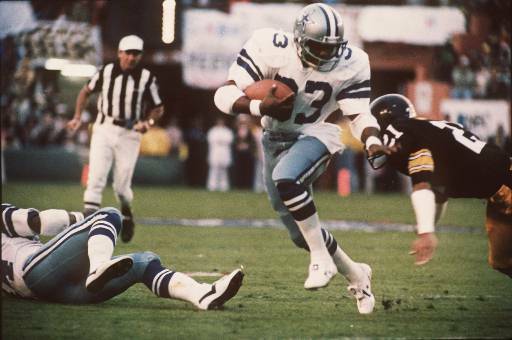 Fortunately, Dorsett did play a big part in the Cowboys drive to victory in Super Bowl XII. In spite of what he accomplished on NFL gridirons the next decade, Dorsett still felt unfulfilled. For starters, he never won an NFL rushing championship. Even in his spectacular 1,646-yard 1981 campaign, George Rogers of the New Orleans Saints beat him out for the league title by 28 yards. The nearest he came to a league statistical championship was in the nine-game 1982 season when he led the NFC with 745 yards. As brilliant as he was, Dorsett was named All-NFL only once, in 1981. He did gain All-NFC honors in 1978, 1981 and 1982. He played in only four Pro Bowls following the 1978, 1981, 1982 and 1983 seasons. Dorsett felt that, if he could run the ball as many times as Walter Payton or Earl Campbell, he could match or better their yardage totals. But Landry was concerned about over-using his prized running back and the perils that could befall him if he did. "If I wanted to risk Tony, I think he could gain as many yards as Payton and Campbell," the Dallas coach explained. "But Tony is so much different than Earl, who is so big. Payton is probably the strongest little man I have ever seen. Then there is Wilbert Montgomery, who did get used a lot and got hurt. I don't want that to happen to Tony. " Despite the pounding he took over the years, Dorsett did prove to be quite durable. He missed only three games of 142 possibly contests in his first nine seasons in Dallas. But the injuries came more quickly in 1986 and 1987 and his yardage began to drop dramatically. Part of the reduced yardage, however, could be traced to the presence of another running back, Herschel Walker, who had moved over to the NFL from the rival United States Football League. Walker, at 6-1 and 223 pounds, was much bigger and stronger than Dorsett and Landry planned to spread the rushing responsibilities reasonably evenly between the two. By this time, Dorsett was playing on two sore ankles and he was further hampered by a bad frame of mind. Tony outgained Walker, 748 yards to 737, in 1986. Before the 1987 season, Dorsett got his "11,000-yard checkup" - arthroscopic surgery on both his ankles - to hopefully improve the situation. But Walker clearly outdistanced him, 891 yards to 456, in 1987. After the season, Dorsett asked to be traded. On June 3, 1988, Dorsett was traded to the Denver Broncos for a conditional fifth-round draft choice. Dan Reeves, himself a former Cowboy player and coach, was the head coach and, although he had John Elway, he clearly intended to develop a strong running game. When he joined the Broncos, Dorsett had one big goal, that of surpassing the career rushing record of Jim Brown, high on his list of priorities. On September 26 against the Los Angeles Raiders, he rushed a career-high 32 times for 119 yards and two touchdowns and Brown's record was surpassed. 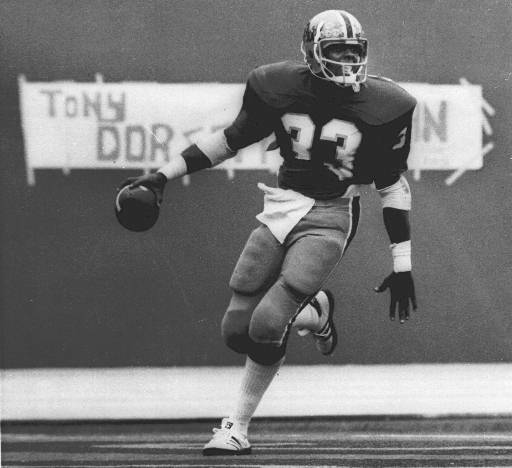 Dorsett finished his season in Denver with a respectable 703 yards and five touchdowns rushing and definitely intended to return for the 1989 campaign. But on what he called "a simple, routine play" during a practice session prior to the season, his knee "crumbled like a piece of spaghetti." He underwent surgery but doctors made it clear that there would be no football for Tony in 1989. In effect, it meant his career was over. "My career? It's one that I can live with," Dorsett summarized. "To be a running back in this league at 183 pounds, sometimes I wonder how I played this long. I'm the second-leading all-time rusher and I played 12 seasons when at one point I thought I would only play five. When I leaf through the pages of my scrapbook someday, I can smile about what I have done." Certainly, Tony was smiling on July 30, 1994 when he was enshrined into the Pro Football Hall of Fame and will forever be remembered as one of the greatest that the game has ever produced.